There are no photos with those IDs or post 15831 does not have any attached images! 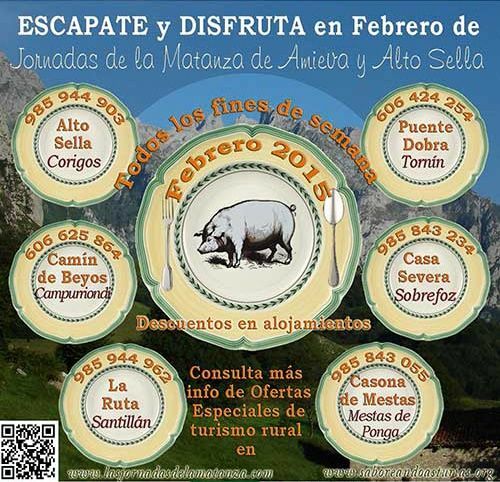 Between the 31 days in January and the 1 in March, the XVIII Jornadas de la Matanza de Amieva and Alto Sella, a gastronomic event in which six restaurants from the municipalities of Amieva and Ponga participate, all the weekends included in those dates. Days declared of Regional Tourist Interest since 2009. Liver soup, pot of cabbage, pregnant borona, hands of gochu, tripe, stewed tongue, boronzu fritu, picadillo and loin, in addition to two varieties of homemade desserts. The menu includes wine and coffee. The conference was presented this year under the slogan 'Escape and enjoy', a message that highlights "the efforts of participating establishments," according to Juan Carlos Iglesias, president of the Alto Sella Association. That effort was quantified by Iglesias "in the bet that restaurants make by continuing to offer a menu of nine dishes to 25 euros and in the decision of the hotel sector to offer overnight stays during the days with an 10% discount".